John Decker is emeritus adviser to the Flight Projects Directorate at NASA’s Goddard Space Flight Center. Today he is emeritus adviser to the Flight Projects Directorate at NASA’s Goddard Space Flight Center in Maryland, following a distinguished 32-year career at the federal space exploration and research agency. But nearly four decades ago, John Decker ’79 became a master’s graduate in civil engineering at NJIT, an educational achievement he credits for a lot of his professional success. In his free time, Decker has moved from space to stage, applying his undergraduate degree in architecture and fine arts to the design and construction of theater sets. 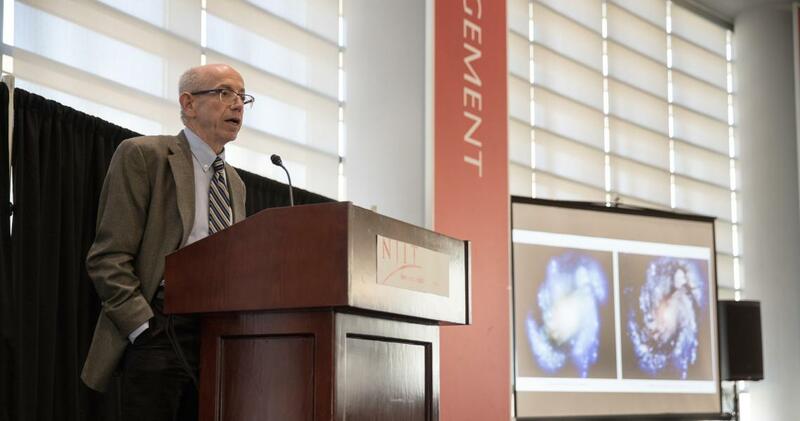 NJIT recently welcomed the esteemed alum for a two-day visit, Nov. 30-Dec. 1, during which he toured his old academic stomping grounds, informally networked with students, staff and faculty, and shared his “out of this world” experiences at NASA. Following are some of the highlights of his stay. (Above) An interest in the dynamic analysis of structures led Decker to enroll at NJIT to study this area. During his return visit to campus, he toured both the Concrete Testing Lab in Colton Hall, where he spent many hours, as well as the new Resilient and Sustainable Infrastructure Laboratory in Weston Hall, pictured here in the background. He acknowledged that his structural analysis work at NJIT prepared him well for his job at NASA, which called for analyzing the stress and strain pertaining to satellites. “It’s all the same physics,” he said. (Above) A late-afternoon reception in Fenster Hall drew faculty and Ph.D. candidates to hear Decker talk about his joining NASA in 1985 and applying his civil engineering background to the construction of a space station at the federal government’s request. He also commented on inventing parts for the Hubble Space Telescope and presented viewgraphs showing Goddard Space Flight Center’s divisions in the Applied Engineering and Technology Directorate. Decker is hopeful that job opportunities at NASA will increase as a result of the current wave of older employees like him retiring. (Above) Decker’s visit culminated with the Albert Dorman Honors College colloquium, “Shooting for the Stars: From NJIT to NASA.” A large crowd in the Campus Center Atrium listened as Decker told how he took evening classes at NJIT to earn his Master of Science in civil engineering, went on to do earthquake analysis of safety-related structures at nuclear power plants, and ultimately jumped at the chance to work in structural dynamics analysis at the Goddard Space Flight Center. He also spoke about and shared images from the Hubble Space Telescope, describing it as “perhaps the most productive science device mankind has ever built” and noting its longevity — Hubble was designed to be in space for 15 years and has been there for 27.